The animals and the environment were beyond expectations. We were able to lay in bed and watch giraffes!!! Beds were wonderful! The bathroom has a bad design, the large door opens into the toilet/bathtub area. There is not enough room to bath or groom efficiently. Older property needs updating. Otherwise the amenities are excellent. The restaraunt Jiko is pricey but worth the money. Super great place! Highly recommend, Disney always impresses. They are renovating, our room must be next on the list. Shower sprayed the wall outside the shower and TV didn’t pick up channels. Great hotel, great stuff but beds are not comfortable. Pillows were like they were made of rubber. 5th stay at this property. Beautiful lobby. Staff always attentive. Love talking to staff about the animals on the property. Unique experience. Beautiful theme hotel. Excellent staff. Accommodating and friendly . Restaurant facilities to accommodate any pocketbook - Jiki was truly a 5 star meal for us. However, not all rooms within a price-class are created equal (as we discovered on check in) beware the ones that look over or onto an roof or into a stairwell. Staff will help if you are not happy with the accommodation. The rooms are smaller than expected, well appointed but no USB ports. All in all, having a quiet dawn coffee watching the giraffes and zebras can not be beat! Nice place nice staff kids had amazing time. Would highly recommend it. Staff always had a smile on their faces and the hotel decor was amazing. the 1st room had a queen bed and a bunk bed we ordered 2 queen beds the 2nd room faced fenced felt like a prison finally they gave us a third room 1.5 hours later room keys did not work and when we finally got inside room it had used water bottles around room 6 of them used mouth wash dirty towel hanging from shower but the beds were made up. not what i expected from a Disney resort very disappointing. The room was comfortable and lovely. Had none of the issues I read about in some of the more negative posts. My only issue is how small it was. We had a Savanna View Bunk Bed room. There was very little room to relax and unwind at the end of the day. You get a great deal for your money, just wish there was a little more space. On the plus side, the Disney Magical Express shuttle and luggage service was excellent, and the shuttles to and from the other resorts and the parks were great. The outdoor movies at night is a great option, as well as s'mores by the campfire. The pool and arcade were excellent. Watching the animals right outside your balcony is a pretty amazing treat for the kids and adults. The customer service is outstanding. The food prices are a little on the high side and you should definitely bring an insulated refillable water bottle for each person traveling to use in the parks and around the hotel. Everything was excellent with two exceptions, the room is incredibly small. Designed for four people, our party was three, and we were on top of each other. Fortunately the second portion of our Orlando vacation will be at a condo. Secondly, the cost of food is way out of this world. One orange, 1.50, one yogurt, 3.49. The reasonably priced food restaurant menu has about 10 items and if you like to eat healthy or vegetarian, there isn't a lot of options, so it can get old fast. Having said that, the food was good, except the breakfast potatoes, they are as advertised, potatoes. Quick getaway trip to Florida including an overnight in a safari room! So serene watching cattle, birds and giraffes from the balcony. The pool and grounds were lovely too! The Disney is all about the details. From the outside grounds to the hotel interior you are submerged in culture and feel as if you are in Africa. There is alot to do for kids and grown ups. The staff was great and I would definitely stay at this hotel again. we had a great time being surrounded by animals. Also, the night tour thru the park around the hotel was amazing. Glad we had signed up for it. The greatest place ever! We had a standard room, but it had a partial Savannah view, the kids loved sitting on the porch, playing I-spy and seeing some animals. The pool is amazing, with a water slide, playground, viewing spots for the animals, work out center, laundry. Amazing dining options and good hours. Zebra domes are addictive desserts only found at Animal Kingdom Lodge. 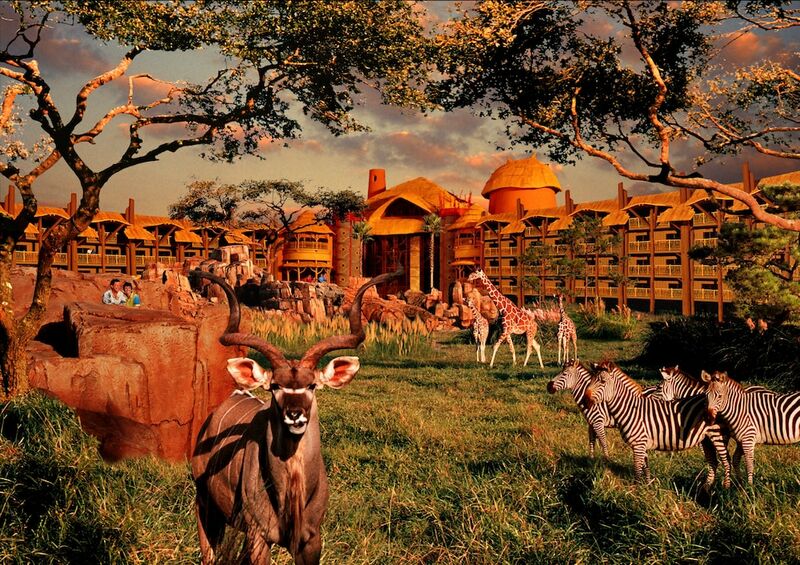 The hotel was a fun place to be, such good, lively energy in the lobby, the best theming of any hotel, and cultural experiences to learn more about Africa and the wildlife from Africa. It is the farthest hotel from the parks other than Animal Kingdom, but busses were efficient and when we had a wait, there was always a staff member who would stop to talk to us. Everyone we encountered was lovely and charming towards the kids. There is still more to discover (we didn't even get to the splash park at Kidani village, or do the arcade). Will just have to go back! Not sure we could stay anywhere else after staying at Animal Kingdom Lodge, seriously the greatest vacation experience. Only regret is we should have done less days in the parks so we could enjoy the hotel more! Located in Bay Lake within a short stroll of Disney's Animal Kingdom® Theme Park, Disney's Animal Kingdom Lodge is within a 10-minute drive Disney's Blizzard Beach Water Park. This 1293-room, 4-star resort welcomes guests with 2 outdoor pools, 3 restaurants, and free in-room WiFi. This resort is home to 3 onsite restaurants, perfect for a quick bite to eat. Satisfy your hunger without leaving your room with 24-hour room service, or quench your thirst with a beverage at the bar/lounge or coffee shop/café. For your convenience, breakfast is available for a fee. A TV comes with satellite channels, and guests can stay connected with free WiFi. Other standard amenities include a balcony, an iPod dock, and a refrigerator. Guests of Disney's Animal Kingdom Lodge enjoy access to 2 outdoor pools, a kids' club, and an arcade/game room. Parking is USD $24.00 per night (USD $33.00 per night for valet parking)—but if you prefer not to drive, catch a ride in the free airport shuttle (available 24 hours). The front desk has multilingual staff on hand 24/7 to help with concierge services, dry cleaning/laundry, and luggage storage. Other amenities at this family-friendly resort include express check-in, express check-out, and free newspapers.